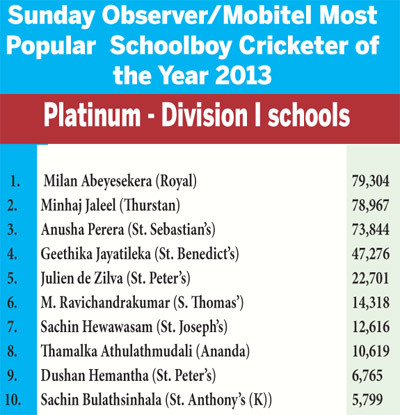 Royal College, Colombo’s wicket-keeper/batsman Milan Abeysekera polled 79,304 votes to take the top position while Minhaj Jaleel of Thurstan College, Colombo who occupied the first place last week, dropped to the number two slot polling 78,967 conceding a 337 vote lead in the ‘Platinum’ segment for schools taking part in the SLSCA Division I tournament at the end of the 22nd week and the penultimate count in the Sunday Observer/Mobitel Most Popular Schoolboy Cricketer Of The Year Contest 2013. 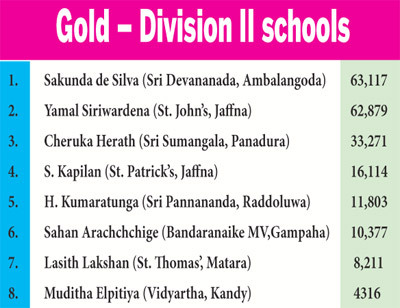 In the ‘Gold’ competition for Division II schools, Sakunda de Silva of Sri Devananda ,Ambalangoda, climbed one step up to take the top spot, polling 63,117 votes over St. John’s, Nugegoda’s Yamal Sirirwardena who was ousted to the second place with a deficit of 238 after polling 62,879 votes. 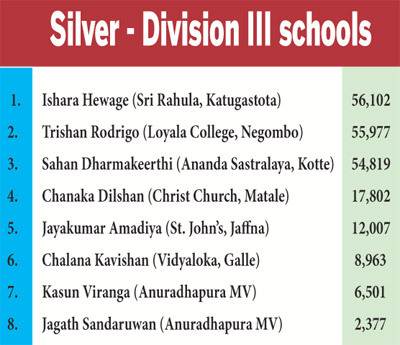 In the ‘Silver’ contest for division III schools Sri Rahula, Kandy’s Ishara Hewage with a lead of 105 votes lead took the top spot with 56,102 votes over Loyala College, Negombo’s Trishan Rodrigo who led last week. With the closing date for the coupons just one week ahead, entries have been pouring in. The readers will get the final opportunity this week to vote for their favourite schoolboy cricketer.